Whether you're looking for lake homes, cabins, lakeshore, rural acreage, hunting land, residential or commercial properties, we are here to make your search successful. 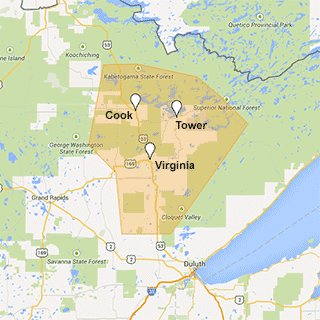 The Vermilion Land Office professionals service numerous residential, in-town, areas, including: Virginia MN, Tower MN, Eveleth MN, Cook MN, Babbitt MN, Biwabik MN, and others. See our location map to the right. The real estate professionals at the Vermilion Land Office have extensive knowledge of real estate in Northern Minnesota and are committed to giving you service and attention for all your real estate needs, including Certified Residential Appraisal Services.